This post in my series of Alaskan Adventures is yet again another first for me. Up until this summer, I had not seen whales in the wild, landed on a glacier via helicopter, or hiked through a temperate rainforest before. So, what’s to stop me from another first – exploring a fjord? With the opportunity to go by boat from Juneau to one of the most spectacular fjords in the U.S., I jumped aboard Captain Cook, one of the Adventure Bound fleet. I just had to see with my own eyes: what a fjord is, what it looks like, what it sounds like, and what all this raving is about. For those readers that do not know, a fjord is a word that comes to English from Norwegian. Fjord is pronounced as Fee-Yourd. Now mind you, I always have problems ignoring the J. So, I typically preface by imagining a yodeler yodeling, which gets me into the right mindset. So, what is a fjord? A fjord is a long, narrow waterway from the sea with no outlet; thus, it isn’t a channel or passage way. Also, it is typically between very steep cliffs and formed by glaciers. The most famous areas for fjords are Norway, Iceland, New Zealand, Patagonia, and of course Alaska. My first trip to see a fjord was rainy, as are most activities in the Southeast Alaska. It took roughly nine hours while we covered over one hundred and fifty miles. It surely was an investment of time. However, remember good things come to those that wait. I think the return on investment (ROI) on this trip is abundantly clear. As a picture speaks louder than words and well a video louder than a picture while addressing more of one’s senses, I created a quick tour of my virgin fjord experience to transport you virtually to my experience. You tell me if the ROI was high. Enjoy my brief video highlighting the Tracy Arm Fjord. It’s not to miss. As a special treat, I spotted a calving of one of the glaciers. 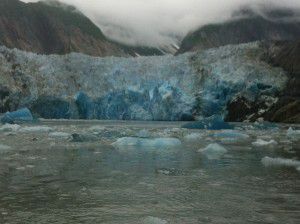 Yes, that’s right, I witnessed a large portion of the Sawyer Glacier falling into the fjord creating an iceberg. It was unbelievable; plus, the sound was like that of powerful thunder or fireworks. Do view for the beauty and calving! It was yet another good time and good story. Many thanks to Captain Steve and Stewardess Stephanie on the Captain Cook.